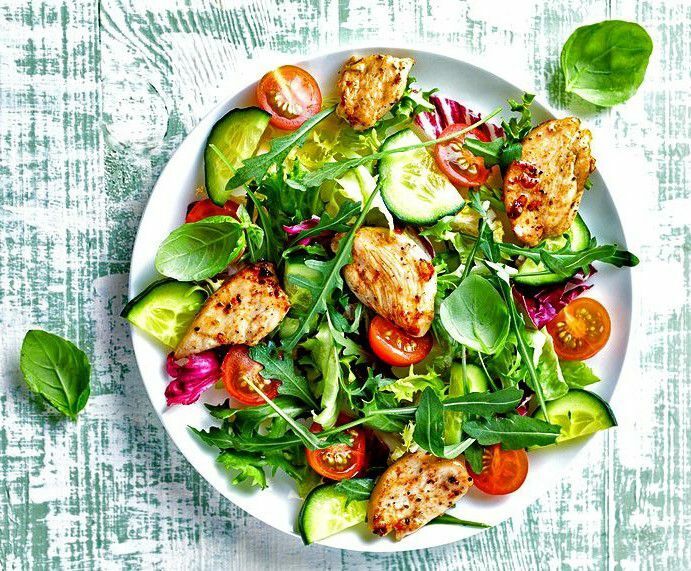 Our Thai grilled chicken salad with lemongrass-coriander dressing will thrill your taste buds! It starts with strips of chicken breast marinated in a garlic-pepper sauce. The chicken is then either grilled on your barbecue or "oven barbecued" using the broiler in your oven. Place over a bed of summer greens tossed in a lemongrass-coriander-lime dressing, top with a sprinkling of fresh basil, and you have a complete meal that is so Thai-delicious, you'll want to make it your number one salad this season! Mix the marinade ingredients together in a cup except for the pepper. Slather over chicken, ensuring all parts are equally covered with marinade. Then sprinkle ground pepper all over the chicken's surface. Allow chicken to marinate in the refrigerator for at least 10 to 15 minutes (or up to 24 hours). If using the oven: Set oven to broil and place chicken on a broiling pan or a foil-lined baking sheet (turn out the sides of the foil to prevent juices from spilling into the oven). Place chicken on the second-to-highest rung of your oven, allowing it to cook 5 minutes each side, then turning. Continue broiling and turning until cooked (chicken will be lightly charred around the edges). Use the leftover marinade to baste chicken the first time you turn it. If using a grill: Place chicken over a hot grill and cook until well done. Use leftover marinade to baste chicken when you turn it the first time. To make the dressing: place water, lemongrass, and lime leaf strips in a saucepan and bring to a boil. Boil for 1 minute (this will soften the lemongrass and bring out the flavor of the lime leaf or zest). Remove from heat. Add the rest of the dressing ingredients and mix well. Taste the dressing. It should be tangy, or a balance of salty, sweet, spicy, and sour. Adjust it to your taste by adding more fish sauce if not flavorful or salty enough, more lime juice if too salty or sweet, more sugar if too sour, or more chili sauce if not spicy enough for your taste. Toss the salad with the dressing. Portion out the salad among individual plates, and top with the fresh herbs, then strips of the hot chicken. Serve immediately, while the chicken is still warm.